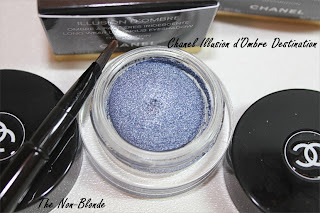 I've been excited about the Blue Illusion de Chanel Collection from the very first moment it was announced months ago. I still hang on to my 2003 Jeans de Chanel palette (it was a fabulous one). 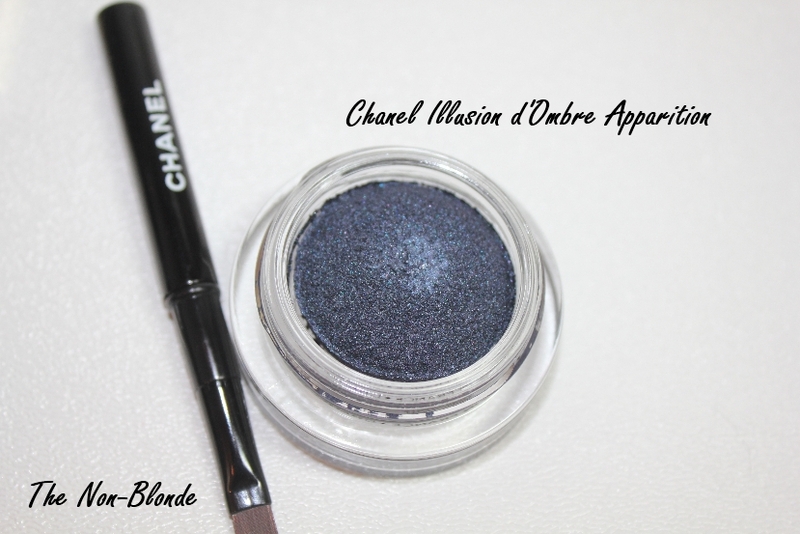 When Chanel does blue it's always perfection (see Lagons and Bois Bleu), so I snapped Apparition and Destination as soon as they landed. I could spend an unhealthy amount of time just staring at these little pots of Chanel Illusion d'Ombre in . 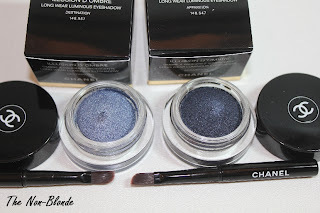 I've always been fascinated by blue eye shadows and these are so pretty and unique. And so Chanel. 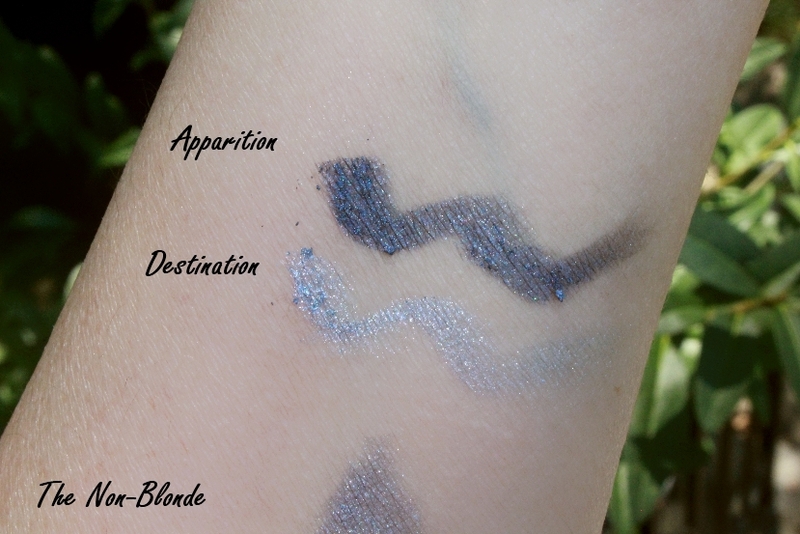 Illusion d'Ombre Apparition is the darker one, a somewhat grayed navy blue. Destination is a silver blue like winter sky. The texture of Apparition is similar to the one of Riviere, so it's more springy and less glittery, while Destination is more like the first Illusion d'Ombre that were released last fall . I much prefer it this way. Each Illusion d'Ombre eye shadow comes with its own brush that actually works very well. I've also been experimenting with various other eye shadow brushes to see the different effects I can get, but you really don't need much beyond this brush brush and your fingers. 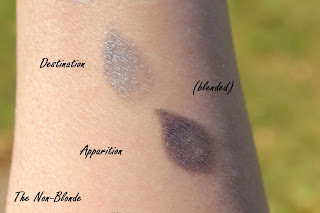 I've used both Apparition and Destination as a sort-of-liner smudged at the base of the lashes with a touch of black mascara and nothing else. Cream eye shadows are like that: good for a high-impact quick look. Is this a must-have? Only if you wear blue eye shadows/liners, which I do and highly recommend for the brown-eyed among us, even if you're very conservative in your makeup looks. A light hand and careful blending will give you that extra something you can't get from brown, taupe and beige. I promise. Chanel Illusion d'Ombre Apparition and Destination ($36) are limited edition. Available from Chanel.com. 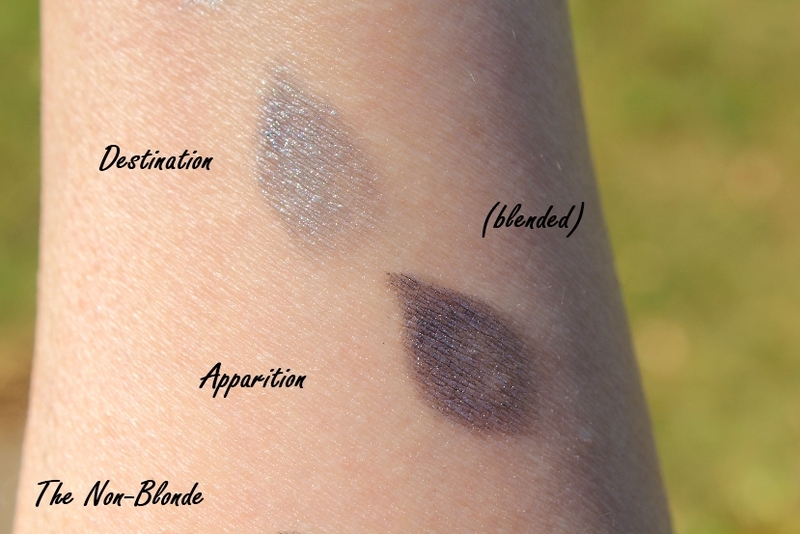 Thanks for the review & swatches! I initially was going to pass on these, but finally placed an order a couple of days ago and am looking forward to trying them out :) I love the way blue looks on those with brown eyes. I have green eyes, so blue doesn't look that great on me, but I find I can't resist Chanel's Illusion d'Ombre shadows! They have such a fun texture to work with.